Series consists of geological maps published by dominion (federal) and provincial government agencies. 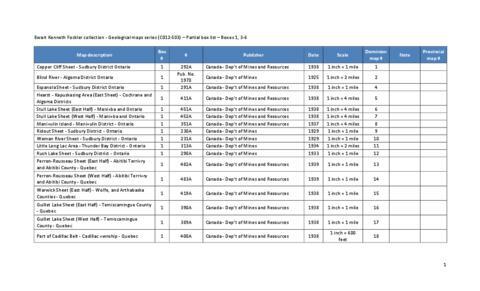 A partial box list (C012-S03_Fockler_collection-Geological_maps_series-Box_list-Boxes 1,3-6.pdf) is attached to this record and is available for download by clicking the icon at top. The list covers the contents of boxes 1,3,4,5,6 only. The list contains: map descriptions, box numbers, names of publishers, dates, scales, notes, and identification numbers.